Up for sale is a brand new pre-wired pickguard with a set of 3 genuine Fender Hot Noiseless pickups (the pickups used by so many great guitar players like Jeff Beck himself). These ceramic pickups are the hottest Fender pickups! Everything comes with the pickguard is brand new never used. 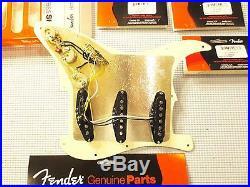 The original packaging for the Fender pickups, USA made Fender switch, and Fender CTS pots will be included. This loaded pickguard uses the highest possible quality parts, and the sound will be amazing on your guitar! You want the right gear to the get the right sound! 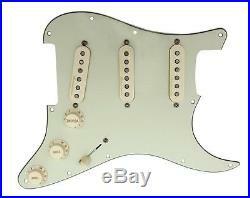 The color for this listing is aged white on parchment (aged white) pickguard. There is a protective plastic cover on the pickguard to be peeled off when you get it. The cool thing about this loaded pickguard is that we will install a 7 way mini toggle switch between the 5 way switch and the volume knob (not shown in the pictures). This allows you to combine the neck and bridge pickups, and/or use all three pickups at the same time. Otherwise it comes with the 7 way switch. This listing is for regular 11 hole pickguard, and it will fit all Fender American, Mexico, Japanese, and Custom Shop strat with 11 mounting screw holes. We can do any color and any hole pattern for you. Regular 11 hole, 8 hole, or the 62 hole pattern. Our 11 hole modern or 8 hole vintage style pickguard will fit all Fender American, Mexico, Japanese, and Custom Shop strat. Just use your imagination to make your pickguard different from everyone else, and. (see below for color options). We can also do any custom pickguard loaded with any pickups with any custom wiring needs. For example, you can combine Fralin pickups with any Fender or Duncan pickups; or add a Duncan liberator system or 1-3 mini toggle switches (like 7 function Gilmour switch, or the phase inverting switch, or a coil split push pull pot, or a Fender S1 system, adding a bassplate or vintage shielding etc) for more versatile wiring (extra charges may apply). Our Custom Shop can do ANYTHING you want! Just send us a message and let us know what you need! Everything coming with the pickguard is brand new genuine Fender parts. 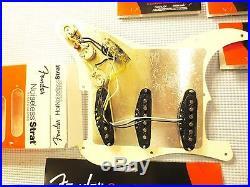 -Brand new Fender Hot Noiseless strat pickups. Brand new Fender 60s style 5 way toggle switch. Brand new Fender CTS pots (top quality, if ywou know them). The same American-made top quality cotton wrapped (shielded) wires used in Fender Custom Shop (Double-cloth jacket has a waxed cotton outer braid and a Celanese inner braid just like Leo used). High quality no lead soldering tin free from oxidation (the same used on high end stereo system). New Fender pickguard in any color as you want. The original new packaging for all parts we use will be included (see pictures). There are two long lead wires (one hot, one ground) soldered to the volume pot (not shown in the picture). So all you need to do is connect these two wires to your output jack. Cannot find the color you want? For more color and hole pattern customization options and more info, see here. Of course return is accepted if not as described. But if you simply don’t like the product, you can always return it within 14 days after receiving it! We work hard to accommodate any needs of our buyers including combined packaging and we declare custom report friendly. These will absolutely bring your playing skills up onto a higher level! Yngwie Malmsteen Signature Guitar Licks: The Best of Yngwie Malmsteen, A Step-by-Step Breakdown of His Guitar Styles and Techniques. Steve Vai Guitar Styles & Techniques. Metallica Style and Techniques Riff by Riff. Jennifer Batten Two-hand Rock for Guitar. The Best of Joe Satriani : A Step-by-Step Breakdown of His Guitar Styles and Techniques. Advanced Lead Metal Guitar Method by Troy Stetina. We custom assemble loaded/prewired pickguards in our custom shop. And you can choose combination of any pickguard, covers, knobs, pickups or routing scheme from the following list. Or if you want something not on the list, let us know and we will get it for you. Part of our inventories and prices: choose from 15 colors for loaded pickguards (lefty versions available). Fender Custom Shop 54 Strat pickups. Fender N3 Noiseless Strat pickups. Fender Vintage Noiseless Strat pickups. Fender Artist Signature series loaded pickguards. All colors and all hole patterns, and lefty models. Part of our inventory. Fender pickguards SSS 11 hole. Fender Black 3 ply 11 hole. Fender White 3 ply. Fender Chrome 1 ply. Fender Gold 1 ply. Fender Parchment/aged white 3 ply. Fender Gold Anodized 1 ply. Fender White Pearl 4 ply. Fender Aged white Moto/aged white pearl. Fender Black Pearl 4 ply. Fender Tortoise Shell 4 ply. Fender Mint Green 3 ply. Fender Black Glass Sparkle. Fender Aged Glass Sparkle. Fender pickguards SSS 8 hole. 57 Reissue SRV Black Pearl 8 hole. Tortoise Shell 4 ply. Gold Anodized 1 ply. Fender pickguard SSS 62 pattern 11 hole. Mint Green 3 ply. AXL pickguards (quality, sturdy parts). Aged cream 3 ply 11 hole. Black pearl 3 ply 11 hole. Blue pearl 3 ply 11 hole. Aged cream pearl 3 ply 11 hole. Red pearl 3 ply 11 hole. Aged cream 3 ply 8 hole. White 3 ply 8 hole. Black 3 ply 8 hole. Pearl white 3 ply 8 hole. Mint green 3 ply 11 hole 62 pattern. White 3 ply 11 hole 62 pattern. Fender Custom Shop 69. Fender Custom Shop 54. Fender Custom Shop Fat 50s. Fender Original 57/62 pickups. Fender Vintage Noiseless pickups. Fender Hot Noiseless pickups. Fender Lace Sensor (all colors). Fender Super 55 Split Coil pickups. All types of Seymour Duncan pickups. All types of Dimarzio pickups. All types of Lindy Fralin pickups. All types of EMG pickups. The item “Fender Hot Noiseless Loaded Strat Pickguard Aged White on Parchment 7 Way USA” is in sale since Sunday, July 23, 2017. This item is in the category “Musical Instruments & Gear\Guitars & Basses\Parts & Accessories\Guitar Parts\Pickups”. 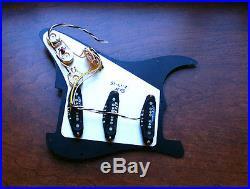 The seller is “twilightguitars” and is located in Los Angeles, California. This item can be shipped worldwide.